Mahamudra - "s/t" / Guilherme da Luz - "Translucent Darkness"
Mahamudra is a guitar/bass/drums/keyboards instrumental quintet from Portugal who play progressive rock with jazz fusion, space rock, psychedelic and krautrock influences. Yes, I know that's quite a stylistic variety!! "A Energia" opens the set and is a jazz fusion infused progressive rock tune with bubbly alien synths added for some extra cosmic space rock color. It's got a great jamming groove, driven by Guilherme da Luz's keyboards. "No Labirinto Cosmico" is next and begins with a dark and heavy prog feel, like an old Goblin tune, but also has jazz fusion influences and a spaced out psychedelic vibe. At 16 minutes the band really stretch out and explore and get into some nicely freaky spaced out fun, with chants and electronics, but never straying too far from the prog and fusion core. 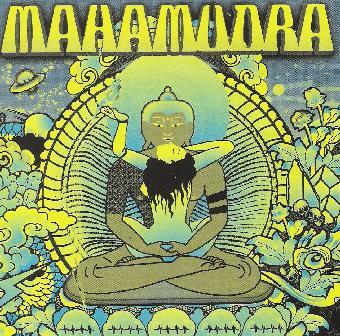 It's a great combination of stylings that you wouldn't normally hear together, though Mahamudra make it sound so seamless and cohesive and it helps to shape the band's sound. I also hear some vocals later in the track but they're completely buried in the mix. "Buscando" and "Para Todo o Sempre" feature cool jamming prog/fusion with spacey atmospherics, with "Buscando" having some of the most frenzied playing on the album. And "O Encontro Com" starts off as a pure deep space exploration, building after a couple minutes into an intense free-for-all space-fusion-prog jam. But my hands down favorite of the set is the 19 minute "Mahamudra". The piece is fast and furious right out of the starting gate, injecting a Space Rock & Krautrock vibe into the band's trademark fusion-prog sound. Mahamudra shift thematic gears numerous times, exploring and morphing, and at all times retaining a sense of high energy, totally cosmic intensity. Amon Düül II and Ash Ra Tempel came to mind at times, though Mahamudra are in no way retro or derivative of these bands. Hot stuff, yet some of the best moments are during the spaced out fusion jams. An outasight improvisational excursion, and one that showcases the various styles and influences heard throughout the album. 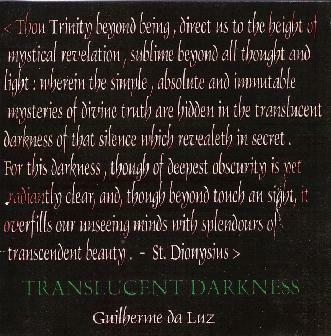 Translucent Darkness is a solo album by Mahamudra keyboardist Guilherme da Luz. I struggled a bit to understand the discography on the Mahamudra web site, and though I didn't see this title listed it looks like Guilherme may have several other albums under his belt. And while I couldn't quite make out the track titles, it really doesn't matter because the CD really plays like a continuous 70 minute journey through space. It's chock full of deep space freaky UFO electronica with a dark church organ melody over the top. Wild stuff indeed. And like the Mahamudra album, Guilherme keeps things interesting by working with and manipulating contrasts. Much of the album reminded me of a blend of Tangerine Dream and American underground experimental space explorers of the 80's & 90's like Alien Planetscapes, Mental Anguish, Nomuzic and Hal McGee. There's also lots of more subtle and quiet space ambience, colored by all manner of fun freaky sounds and a gorgeous meditative, image inducing vibe. But though the music is cosmic, freaky and exploratory, Guilherme's progressive rock side shows through in the feeling of thematic development that's apparent throughout the album, often like a cross between Eloy and a symphonic progressive phantom of the opera. Overall an impressive and enjoyable set of electronic space-prog.